Clinton United is searching for a full-time ordained or diaconal minister starting immediately. We are a small town church with a warm family feeling and dedicated volunteers. Pastoral Care, community outreach and music are a strong component in our ‘United family’. To find out more click here: Presbytery Vacancy Scroll down to "Clinton Pastoral Charges" to see details of the opening and application forms. The position includes accommodations at the Church Manse which is within short walking distance to the Church. Details of the property can be found using the above link. As some of you may have heard, Rev. Randy is retiring and his last official service will be Sunday June 10th. On Saturday, May 26 at the Greek Canadian Community Centre in London, Randy Covey was celebrated into retirement. He was blessed by Kate Crawford (Retirement Chair) , Past Moderator Gary Patterson, Executive Secretary Cheryl-Ann Stadalbauer-Sampa, President Joyce Payne and all those in gathered in the room. 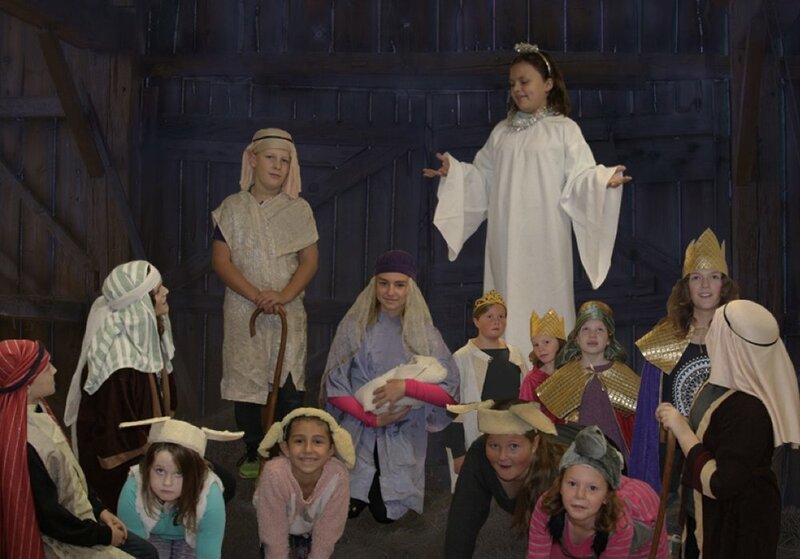 Each year the children of Clinton United Church re-enact the story of the birth of Jesus. This year, with the magic of technology, they have created this electronic version, which was presented at a special service a few weeks ago. It will be presented again at our Christmas Eve morning service and be narrated by our children's youth minister Kathy Douglas. For those of you who can't make it I have recreated it below for your enjoyment. This is part of our sacred story. We tell it over and over. Do you know it? Long ago, when King Herod ruled Judea (now part of Israel), God sent the angel Gabriel to a young woman who lived in the northern town of Nazareth. The girl's name was Mary and she was engaged to marry Joseph. The angel Gabriel said to Mary: “Peace be with you! God has blessed you and is pleased with you.” Mary was very surprised by this and wondered what the angel meant. The angel said to her 'Don't be afraid, God has been very kind to you. You will become pregnant by the Holy Spirit and give birth to a baby boy and you will call him Jesus. He is God’s child and his kingdom will never end.” Mary was very afraid but she trusted God. 'Let it happen as God chooses.' she replied to the angel. Joseph was worried too when he found out that Mary was expecting a baby before their marriage had taken place. He wondered if he should put off the wedding altogether. Then an angel appeared to Joseph in a dream and said: 'Don't be afraid to have Mary as your wife.' The angel explained that Mary had been chosen by God to be the mother of Jesus which means 'Saviour' because he would save people. When Joseph woke up, he did what the angel had told him to do and asked Mary to be his wife. 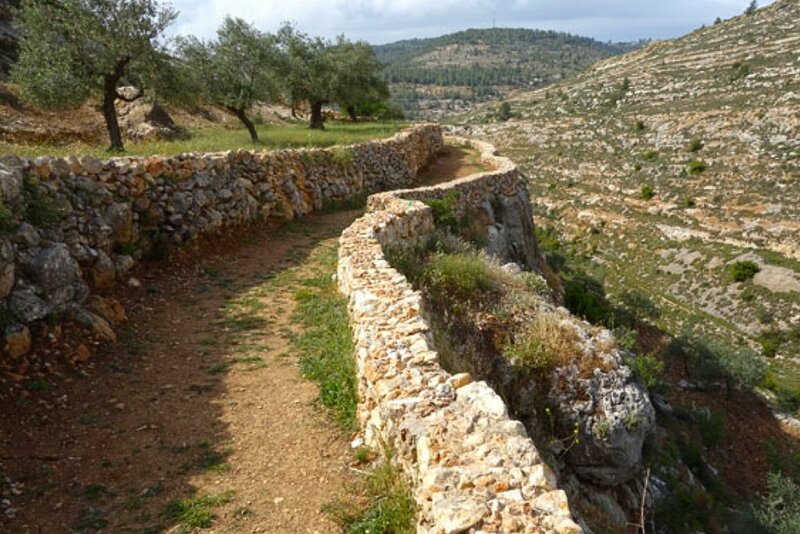 At this time, the land where Mary and Joseph lived was part of the Roman Empire. The Roman Emperor Augustus wanted to have a list of all the people in the empire, to make sure they paid their taxes. He ordered everyone to return to the town where their families originally came from, and have their names registered..
Mary and Joseph traveled a long way (about 70 miles) from Nazareth to Bethlehem, because that is where Joseph's family came from. Most people walked but some lucky people had a donkey to help carry the goods needed for the journey. Joseph and Mary traveled very slowly because Mary's baby was due to be born soon. When they reached Bethlehem they had problems finding somewhere to stay. So many people had come to register their names in the census, that every house was full and every bed was taken in all of the guest rooms. A friendly InnKeeper told them there was no room for them but that they could find a warm place in a stable with the animals. So in the place where the animals slept, Mary gave birth to Jesus, the Child of God. In those days it was the custom to wrap newborn babies tightly in a long cloth called 'swaddling clothes'. 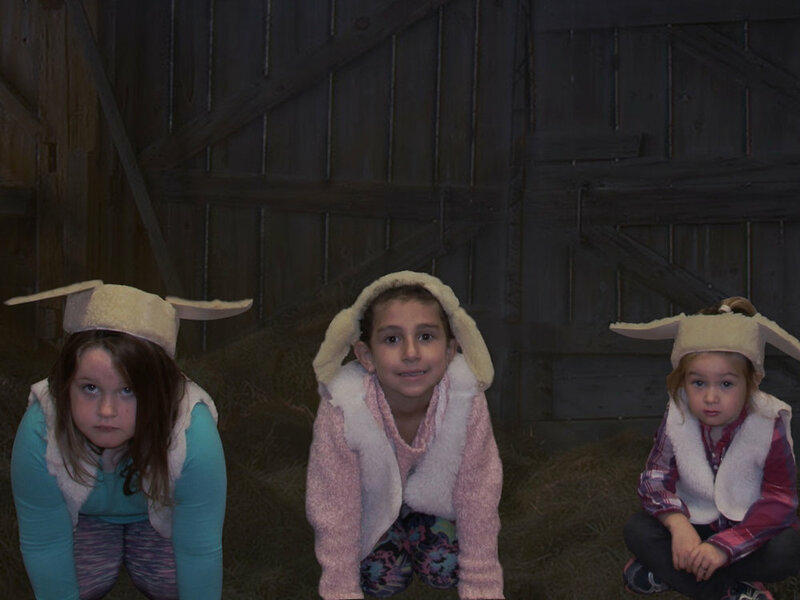 Jesus' bed was the manger that the animals ate their hay from. He was safe. In the hills and fields outside Bethlehem, shepherds looked after their sheep through the long night. As the new day began, suddenly an angel appeared before them and the glory of God shone around them. The shepherds were very, very scared, but the angel said, 'Don't be afraid. I have good news for you and everyone. Today in Bethlehem a Saviour has been born for you. 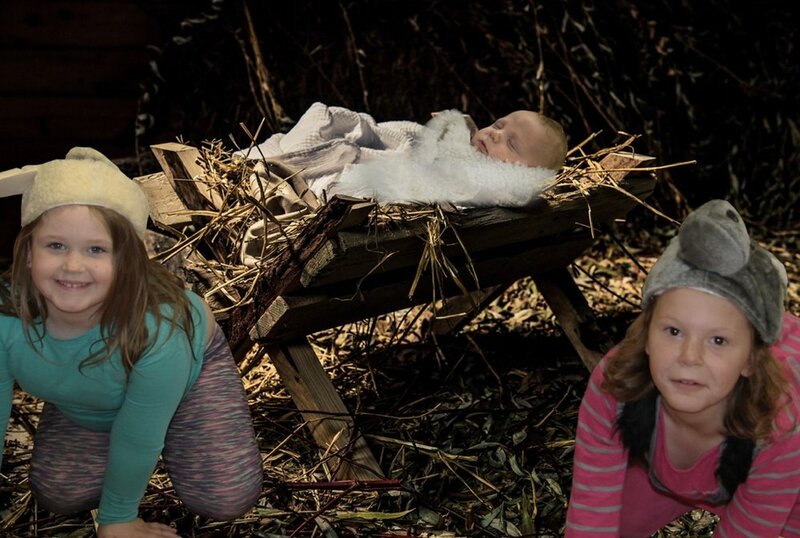 You will find the baby lying in a manger. Then many more angels appeared, lighting up the sky. When the angels had gone the shepherds said to one another, 'Let's go to Bethlehem to see what has happened.' So the shepherds went to Bethlehem and found Mary and Joseph. The baby Jesus was lying in a manger as they had been told. When they saw him, they told everyone what the angel had said and everyone who heard the story were astonished. Then the shepherds returned to their sheep, praising God for sending his Son to be their Saviour. When Jesus was born, a brand new bright star appeared in sky. Some Wise Men in faraway countries saw the star and guessed what it meant. They were very clever people that studied the stars and had read in very old writings that a new star would appear when a great leader was born. They set out to find the new king and bring him gifts. Herod, the king of Judea, heard this and it made him very angry to think that someone might be going to take his place as king. Herod sent for the Wise Men to come to him. He told them to go on following the star until they had found the baby king. He said: 'When you have found him, let me know where he is, so that I can go and worship him.'. But Herod did not tell them that he really had an evil plan in mind to kill the new king. The Wise Men followed the star towards Bethlehem (where it said that the king would be born in the old writings). It seemed to stop and shine directly down upon the place where Jesus was. The Wise Men entered the house where they now lived and found Jesus with Mary, they bowed down and worshipped him. The Wise Men spread the the gifts they had brought before Jesus. The gifts were gold, frankincense and myrrh. The Wise Men were warned in a dream, by God, not to go back to Herod. So they returned home to their countries in the East by a different way and Herod did not find Jesus. - the Pageant Stars, the Clinton United Church Sunday School Kids.